Topics: Dry Ice, Ice Cubes/blocks, Ice Sleds, Ice Trailers, Insulated Boxes, and Clients. Age: The domain is 17 years and 10 months old. 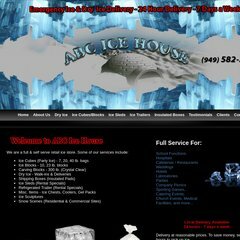 abcicehouse.com ABC Ice House - Dry Ice, Ice Cubes, Ice Blocks, Shipping Boxes ..
Its 2 nameservers are ns1.theplanet.com, and ns2.theplanet.com. Its local IP address is 66.98.168.86. It is hosted by Theplanet.com Internet Services Inc (Texas, Houston,) using Apache/2 web server. PING www. (66.98.168.86) 56(84) bytes of data. A time of 41.9 ms, is recorded in a ping test.